Size: 7.5 x 2.5in Made of high-quality metaland plastic;rust-proof,stain-resistant,and dishwasher safe. The sharp and substantial wine bottle opener looks elegant and never go out of fashion. It wont break the cork and end up in your drink. This bottle opener and corkscrew is comfortable to grasp and effortless torotate Comfortable to grasp and effortless to turn to open a stubborn cork. Heavy duty composition ergonomically built with the handles on the wings, this wine opener is simple and comfortable for anyone to use, no matter their grip strength. No need to manually wrestle the cork out of the bottle with our butterfly corkscrew's polished helix worm that is long enough to easily and fully insert into any length cork, making it easily to extract even the longest corks. Spiral drill bit hard, workmanship, strong, easy to remove the stopper, will not burst.and this wing corkscrew prevents the screw from breaking the cork. Sturdy lever arms make it easy to remove pretty much any size cork. Built-in bottle cap opener and corkscrew. 2-in-1 opener, both for beer and wine bottles. Designed in a chic and elegant style. A great gift for everyone from wine enthusiast, professional sommelier, bartender, wine connoisseurs to bar tenders for holidays, housewarmings, and home bars. HOW IT WORKS: Our pressure washer water jet is used to clean dirt and mold on wood, aluminum, tires, glass and concrete. Garden hose nozzle from cars and cleans patios, driveways, and second story windows from the ground. 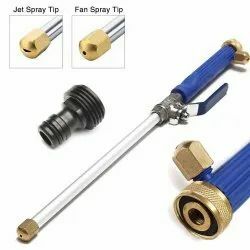 NOZZLES: This is a normal power washer sprayer with two spray tips, a jet stream and a fan spray. Pressure is only related to domestic water pressure, no electricity and no power is required, better meet your needs.Hose Adapter Included ~ Female threaded standard garden hose to ½" quick connect hose coupler with "O" ring Adapter included. Use with powered pressure washer ½" hose with female quick connect coupling. MULTIFUNCTION: Our Power washer wand Nozzle can be used for cleaning built-up dirt and mold on wood, aluminum, and vinyl shutters, concrete sidewalks, wood decks, brick, stone, rock and more. You can easily wash your car, truck, campers, or boats. UNIQUE DESIGN AND EASY TO USE: Our Power Washer Wand has a unique design that controls flow to establish the power flow of the hose. They solve the problem of requiring high power water, making it easier for you to clean what you want to clean. Easy to use: Quickly connect any garden hose. [ Front Pull Squeeze Trigger with Labor-Saving Clip ] -- A rear push lever metal handle in front of the hose nozzle, bring a more natural and comfortable feeling in the hand when use. Also, it can be clipped to stay permanently on and paused whenever you want. [ 4 Way Spray Setting on the Nozzle Sprayhead ] -- Adjust the water pressure by rotating the head of the spray gun from left to right, flexible water flow can be from central jet, fine mist, moderate spray to jet sream, fulfill your different needs for watering and cleaning. [ Leak-Proof Design with Rubber Washer ] -- Comes with heavy duty solid brass male hose adapter and the rubber hose washer, provides a durable and tight seal for eliminate leak, 100% Leak-Free Guarantee. 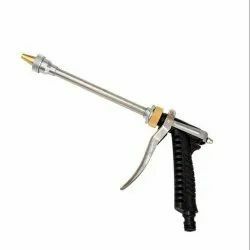 [ Muitipurpose Garden Sprayer Gun ] -- This hose nozzle is great for washing your car, watering plants and flowers in your garden and lawn, cleaning the walkway/driveway/windows, cleaning floor/balcony and anywhere that you cannot get close to, even can be used for your pets and dogs' shower. [ Note ] Please don't put the hose nozzle outside in the winter,the low temperature and the snow will make it broken easily. garden/ lawn watering clean bathroom, kitchen, balcony, corridor, carpet, etc. 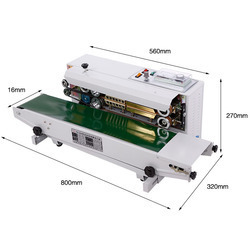 Automatic sealing machine Continuous Band Sealer for PP PVC foil bag. Continuous band sealing machine FR900 plastic bag heat sealer, Sealing Machine Type and Paper Packaging Material Horizontal continuous aluminum foil sealer FRD-1000 multi-purpose ink sealing machine is a new model of automatic plastic film sealing machine, which integrates color printing, sealing, continuous transmission of products, with clean and bright pattern on the sealing part, color selectable, instant printing and instant dry, and convenient to change the characters.